Since the Fall of 1979 until 2011 all Consort recording has been done by Grammy-nominated engineer Curt Wittig (1939-2011). 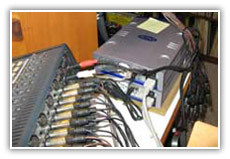 The equipment and techniques used have kept pace with industry developments, beginning with 15-ips 2-track Nagra IV-S analog tape recordings, followed by Beta F-1 digital tapes, all generations of DAT tapes, and now stereo and/or multitrack (depending on the music) recorded directly into 24-bit ProTools with stereo DSD and/or Flash Card backups. All archiving and post-production was done using Digidesign ProTools HD software. The earliest, high risk, open-reel analog tapes required low temperature “baking” according to technical specifications provided by the manufacturers of the various tapes in order to create one clean digital copy. Each concert recording is physically archived in two formats to Gold DVD-R media (estimated 300 year life), supplemented by separate “access” CDs for all individual works in the concert. The first format is a raw copy made as a flat 24-bit transfer of each original recorded work. Each movement of each work is redigitized into two files, the left and right channels. A second format included on the archive DVD is interleaved 16 bit BWF(.wav) files for burning audio CDs that can be used as access copies for listening to the works. Files for the access copies typically have been trimmed (empty leading and trailing time removed) and normalized (audio levels set to maximum that loudest passages permit while still maintaining full dynamic contrasts). These interleaved files have been used to create an individual audio CD for every separate work to accompany each parent DVD in the archive. All of the performed works for a single concert are included on one DVD, and assigned a Persistent Identifier (PI) made up of the year, month, and day of that concert (e.g. 19861206). Individual works on the concert program are identified by the concert PI followed by the sequence of that work in the program, for example 19861206-1 for the first work, etc. In addition to audio files the archive DVD contains a digital copy of the printed program for each concert, in PDF format. Each program typically contains twelve pages with the exact sequence of works, extensive notes by composers and music historians for each work, texts for songs (with translations to English if needed), and notes describing each performer. Also on the DVD are label images which, with the interleaved 16 bit BWF audio files, enable continual creation of accurate access CD copies from the archive DVD, as the original access copies become scratched, broken, or lost. All original recording media, archival recording media, and paper documents from this project are stored in the temperature and humidity controlled storage space at the Michelle Smith Performing Arts Library (http://www.lib.umd.edu/PAL/music.html) at the University of Maryland. This Library is a state-of-the-art facility opened in 2000 and an integral part of The Clarice Smith Performing Arts Center, which houses the University of Maryland’s School of Music, and Departments of Dance and Theater. The Clarice Smith Center is among the leading university performing arts facilities in the nation. Professional archivists will oversee all aspects of storage, organization, documentation, cataloging, and public access, and will supervise accessioning and preservation activities. Additional copies of the digital archive are being stored in three different geographical locations. The recordings were converted to AAC/MP4 format to enable streaming on this web site. This format preserves high quality sound but creates files that are only about 10% of the size of the original audio BWF files, enabling faster streaming. The Icecast open source software provides the streaming services. The open source software jPlayer is used in this site to let nearly all browsers play the archive audio files directly, including Chrome, FireFox, Edge/Internet Explorer, and Safari. The very high quality streamed audio can be best appreciated by attaching equally high quality headsets or self-powered speakers, such as one of the many available “studio monitor” sets in the $200 or above range. Built-in computer speakers and inexpensive desktop systems give only a weak shadow of the available audio quality. Performance recording copyright Twentieth Century Consort © 2019, website content copyright Twentieth Century Consort © 2019. All Rights Reserved.